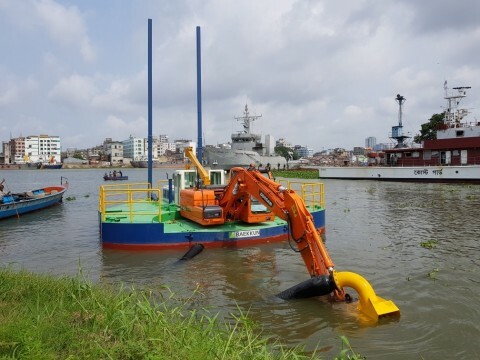 2019-02-27 14:35 출처: BAEKKUN DREDGING CO., LTD.
Baekkun Dredging Co., Ltd., which developed an eco-friendly amphibious dredger for the first time in Korea, plans to increase its export to emerging economies in Southeast and South Asia, including Bangladesh, Indonesia and India. JEOLLANAM-DO--(뉴스와이어) 2019년 02월 27일 -- Baekkun Dredging Co., Ltd., which developed an eco-friendly amphibious dredger for the first time in Korea, plans to increase its export to emerging economies in Southeast and South Asia, including Bangladesh, Indonesia and India. Baekkun Dredging Co., Ltd. (CEO Baek Do Sun) said that it has gained entitlement to subsidy offered by the Ministry of SMEs and Startups to high-growth exporters and that it will accelerate exports to Southeast and South Asia. Established in December 2009, Baekkun Dredging obtained patents on its eco-friendly dredger and eco-friendly equipment and method for the separation of dredging soil in January 2010. In the following year, it registered a patent on an amphibious dredger. Amphibious dredgers made by Baekkun Dredging are compact dredgers operable on shores, rivers, reservoirs and waterways. As they utilize a range of different attachments, they can perform multipurpose functions such as pump dredging and bucket dredging. During a roadshow held in October 2017 for companies aspiring to clinch contracts with the Bangladesh military and police, Baekkun Dredging signed an MOU with a Bangladesh Navy shipyard to construct dredgers on the spot and put them to local use. It won a bid to supply four amphibious dredgers worth US$3.2 million to the Bangladesh government, and delivered them without a hitch. Baekkun Dredging exports its dredgers to Indonesia and Sri Lanka as well as Bangladesh, and plans to expand its overseas market steadily.